FREE RANGE KIDS has become a national movement, sparked by the incredible response to Lenore Skenazy?s piece about allowing her 9-year-old ride the subway alone in NYC. Parent groups argued about it, bloggers, blogged, spouses became uncivil with each other, and the media jumped all over it. A lot of parents today, Skenazy says, see no difference between letting their kids walk to school and letting them walk through a firing range. Any risk is seen as too much risk. But if you try to prevent every possible danger or difficult in your child?s everyday life, that child never gets a chance to grow up. We parents have to realize that the greatest risk of all just might be trying to raise a child who never encounters choice or independence. LENORE SKENAZY is a syndicated columnist, humorist, and founder of Free-Range Kids. She has written for periodicals from Reader's Digest to The Times (of London) to Mad magazine, and been a commentator on CNBC, the Food Network, and NPR. Her books include The Dysfunctional Family Christmas Songbook and Who's the Blonde That Married What's-His-Name? She lives with her husband and two sons in New York City. Part 1 The Fourteen Free-Range Commandments. 1 Know When to Worry. 2 Turn Off the News. 4 Boycott Baby Knee Pads. 5 Don’t Think Like a Lawyer. 14 Listen to Your Kids. Part 2 The Free-Range Guide to Life. Safe or Not? The A-to-Z Review of Everything. You Might Be Worried About. Library Journal Starred Review - Skenazy flies the black flag of America’s Worst Mom, a title this syndicated columnist and NPR commentator earned by allowing her nine-year-old son to ride the New York City public transit alone in 2008. Here, she puts parents? fears to bed by examining the statistical likelihood of the dangers we most fear (murder, baby-snatching, etc.). Drawing on facts, statistics, and humor, she convincingly argues that this is one of the safest periods for children in the history of the world, reiterating that mostly, the world is safe and mostly, people are good. Even the lowest-flying helicopter parents would have trouble disagreeing that we have entered an era that says you cannot trust yourself. Trust a product instead. Skenazy argues that it’s time to retire the national pastime of worrying and that childhood is supposed to be about discovering the world, not being held captive. The obvious has never been so hilarious. "Skenazy advocates for a child's right to separate gradually from a parent's assistance and to learn the joy and self-confidence that comes from trying out independence." "Free-Range Kids is the best kind of manifesto: smart, funny, rigorous, sane, impassioned, and bristling with common sense. If you’re a parent, or planning to become one, read this book. You have nothing to lose–apart from your anxiety." "Even scaredy-cat parents like myself now have a how-to manual on overcoming irrational suspicions and, finally, differentiating between an axe murderer and a play date!" —David Harsanyi, syndicated columnist and author, Nanny State. 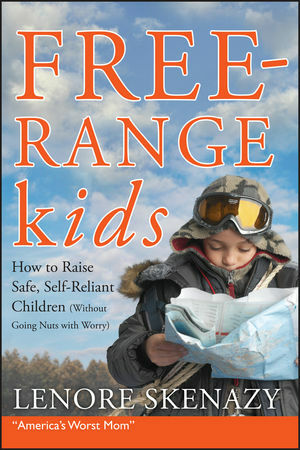 "Free-Range Kids makes the perfect baby shower gift." "Moral insight without moralizing—how rare is that?" "Keep Free-Range Kids on your bedstand next to your bible and the TV remote, and refer to as needed during the 11 o'clock news." "Read this book—Mommy said you could."